So, if all goes to plan, we can watch the burn webcast at http://www.burningman.com/ tomorrow, Sunday. So far though, trying to find details and comms from all this, seem to be really hard. Well, bearing inmind were they are, and what they’re doing, not so supprising eh? ‘Direct Link’ to stream, using QuickTime. Here’s a piece of software that will make any decent human being vomit. Proudly marketed by spyware outfit SpectorSoft, it’s a lowlife Trojan called eBlaster which you can e-mail to anyone in the world and log their keystrokes, and force their POP mail and Hotmail and Yahoo Web mail accounts to copy to you, everything going on at the target machine. “eBlaster records their e-mails, chats, instant messages, Web sites visited and keystrokes typed — and then automatically sends this recorded information to your own e-mail address,” the company proudly states. It’s marketed as a ‘tool’ for over-protective parents and savvy employers, but it’s basically a script-kiddie toy which can be delivered surreptitiously to a victim. The potential for abuse is extraordinary, but the company makes no mention of that. They merely warn that if you don’t own the computer you infect with their Trojan, you’re violating their terms. Surely that stern warning should discourage the malevolent well enough. [yea right]. It’s all part of a growing, set piece where the private communications of human beings is seen as ‘abuse’ on the job. Personally, I come from a free festivals and travelling background. New Age Travellers etc. A number of sayings have helped guide my life over time. Like…. Bring what you expect to find? In sum, this means self-reliance. It means gigs are ALWAYS better, when people attending don’t just attend , but are a main part of the act. It is obvious to all those there, when this magic happens. This is actually where I came in. 1972 Windsor, Stonehenge etc….. These were my motives then and remain so now. Over time, I have been involved I raising awareness about the law changes and their implications to us all. “conduct by a large number of persons in pursuit of a common purpose” being a new definition of serious crime!!! With the new definition of serious crime, that enable the use of some ‘heavier’ police departments to be applied against us. And will be the end of all the RTS and similar gigs. Now, in ‘rave mode’, I have spent time with the Velvet Revolution and All Systems gigs, I had written ‘Sound Advice’ and the ‘Right to Party’ – to try and raise these matters in peoples minds. Well, we have lost each of the matters I’m on about here. Whoever you vote for, the government gets in! DID NOT DO ENOUGH ABOUT ANY OF IT AS IT HAPPENED AND NOW IS STILL GOING ON. People have to realise that self-interest and their own immediate happiness ( hedonism? ), is not enough to make a festival, party rave, traveller site, gathering. Some folks on reading this will have been too young, to have had any objection to these changes as they have happened over recent years. But many others of you will have been there, and should have been ‘able’. The way parties are now organised, between those trying to conform with some pretty onerous conditions, (ie half to 2/3 of a ticket price to ‘self-police’ and pay for your own public order management and drug search.!) and those involved with the ‘free’ end of things but at continued ‘personal’ rather than ‘sheared’ risks. This division is of course orchestrated by the other side. This old hippy / raver? Is now of the opinion that folk have now got the party they deserve. When i first set up blogger, was invited to enable ‘Right click – Blog This! Have tried all this since, and it’s wonderful. Works for BlogQuote also. This is all happening now ….! 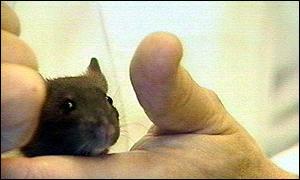 “Researchers” at Cambridge university play dance music to mice on speed. BBC News story Shock! Horror! Some of them died after getting down to some Prodigy. They weren’t let into the little chill out rooms, and all the water taps in the toilets were hot. To set this all in perspective some other mice were forced to listen to Bach, on speed too. Well… they died too. Who knows what sort of music mice get into and what they would listen to by choice whilst doing class A’s. The experiment in which mice were killed with loud dance music after being given amphetamines has been attacked by the Home Office. However, anti-vivisection campaigners have described this as a "slap on the wrist", saying that the team should have been prosecuted for animal cruelty. The experiments, led by Dr Jenny Morton, involved 238 mice, some of whom were given the drugs and then exposed to music from the dance group The Prodigy at high volume. Seven died, and some others were left brain damaged. Some others who were exposed to the classical composer Bach instead also died. Now really!! Where does this get us, in any further understanding ?? ?